Earlier this week the Disney Parks Blog announced the Disneyland Resort's plans for Halloween Time this year, including dates for the popular Mickey's Halloween Party event. 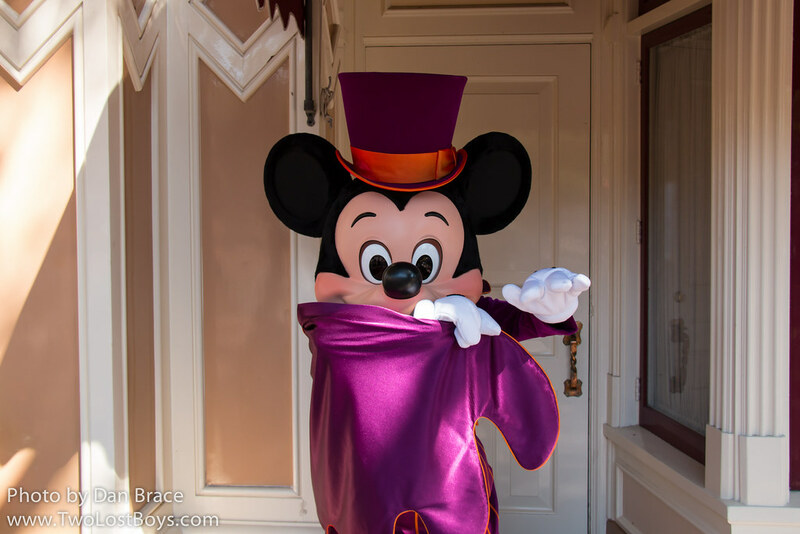 The daytime activities at Disneyland park are anticipated to be the same, with Mickey and friends greeting in their Halloween costumes, Space Mountain Ghost Galaxy, and the Haunted Mansion Holiday overlay. For the most part, the Mickey's Halloween Party event at Disneyland park sounds very much the same as last year, with the return of the Frightfully Fun Parade, which features the Headless Horseman, the Halloween Screams fireworks, character greetings, and more. I'll come back to the party a little later, however, Disney California Adventure will be joining the spooky festivities with its own Halloween celebration, with two key additions. Buena Vista Street will be taken over by Oogie Boogie, and Cars Land will feature "Haul-O-Ween". As featured on the Disney Parks Blog. (C) The Walt Disney Company. 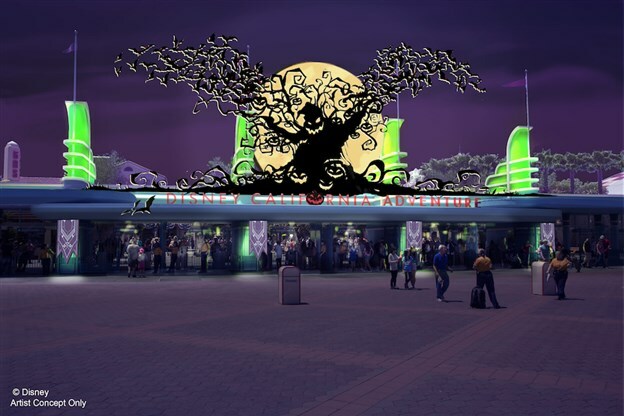 "[A] spell will be cast with new Halloween decor all along this stylish thoroughfare inspired by “Tim Burton’s The Nightmare Before Christmas.” Oogie Boogie has risen from the shadows to take over Disney California Adventure park, and his oversized silhouette beckons guests through the main entrance as a swarm of bats encircle Carthay Circle Theatre." It is not made clear or known at this time whether Oogie Boogie himself will appear for greetings during the event. 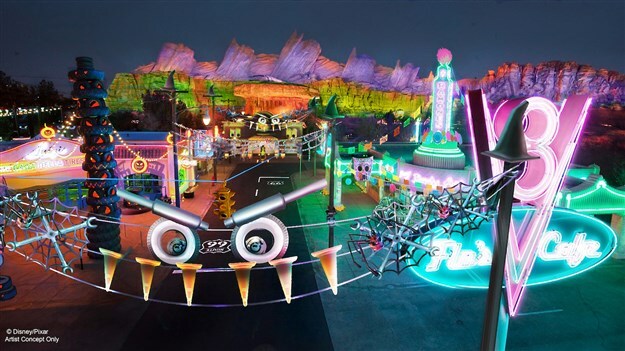 "Cars Land will get all gussied up with four-wheeled frights as the citizens of Radiator Springs don their Halloween costumes and decorate their homes to celebrate Haul-O-Ween. From Fillmore’s Jack-Oil Lanterns and Flo’s Spider-Car to Witchy Miss Lizzie’s shop, everybody’s doing all they can to turn Radiator Springs into Radiator Screams! Guests will experience some of their favorite Cars Land attractions in new ways as Mater’s Junkyard Jamboree becomes Mater’s Graveyard JamBOOree and Luigi’s Rollickin’ Roadsters transforms into Luigi’s Honkin’ Haul-O-Ween." What is really exciting about this is that in that first sentence they reveal that the cars themselves will get special Halloween costumes this year! This will be a first for the Cars Land residents, who previously had only seen Tow Mater wear a special Christmas hat during the holiday season. Halloween Time at the Disneyland Resort will run from September 15th through to October 31st, 2017. A few paragraphs above, I mentioned the Halloween parties and that there was something else to mention. For the first time this year, as well as the regular daytime fun for the season, Disney California Adventure will be a part of the Halloween parties, with early access before the main event in Disneyland. Unfortunately, the DPB does not clarify at this point whether there will be special greetings in DCA, like there previously has been in Toontown at Disneyland park, or whether this is literally just park access for those who do not have regular day tickets/valid APs that day. We really hope that this does not mean that the pre-party greetings in Toontown have been cut in favour of early access over at DCA, because that would be really sad! Also, this year, party tickets include Disney PhotoPass for the event that you attend, which is really nice, as there are some really fun shots you can get during the night. Let's take a look at the dates and prices for Mickey's Halloween Party. September 20, 22, 25, 27 and 29th. October 3, 6, 10, 13, 17, 20, 24, 27 and 31st. Prices range from $85 up to $120 per person, per ticket, plus tax. Tickets should be purchased directly from Disney, here. As more information becomes available, I of course will keep you all updated here on the blog.